Koreans suffered oppression when Japan ruled their country from 1910 to 1945. 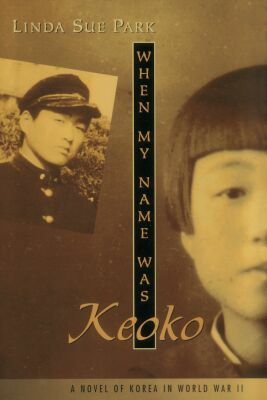 When My Name Was Keoko, a young adult novel based on the historical experiences of the author's parents, depicts the struggles of a Korean family named Kim from 1940 to 1945 as Japanese repression became harsher. Sun-hee and her brother Tae-yul, ten and thirteen years old respectively at the novel's beginning in 1940, jointly narrate the story of each family member's own covert efforts to resist Japanese rule. The novel's title comes from the Japanese law forcing Koreans to take Japanese names. The Kim family chose the Japanese name of Kaneyama, and Sun-hee and Tae-yul reluctantly changed their names to Keoko and Nobuo, respectively. This novel not only provides young readers insight into an often-neglected part of WWII history but also vividly portrays strong emotional reactions to tyranny. Linda Sue Park's historical novels have won much critical praise. In 2002, A Single Shard, a historical novel set in 12th-century Korea, won the Newbery Medal for the most distinguished contribution to American literature for children. In 2003, the American Library Association selected When My Name Was Keoko as a Best Book for Young Adults and a Notable Children's Book. These awards reflect Park's storytelling talent and the thoroughness of her historical research. 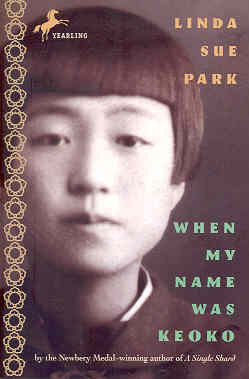 As Park explains in the Author's Note at the end of When My Name Was Keoko, several stories in the book come from her own parents' childhood experiences in Korea. Her mother, just like Sun-hee, used the name of Keoko Kaneyama during Japan's rule over Korea. Although the Kim family clearly hates the Japanese occupation, the author does not demonize all Japanese people in the novel but instead presents Sun-hee's Japanese friend positively and some Koreans negatively as they seek to profit from the Japanese occupation. Sun-hee and Tae-yul alternate as narrators of separate chapters, and many times they both provide individual views of the same events. They explain Korean customs and historical events in an easy-to-understand manner that does not detract from the main story line. Tension fills the book, as each member of the Kim family fears discovery by the Japanese of their secret resistance to foreign rule. For example, the mother with the help of her two children hides a small rose of Sharon tree, the national symbol of Korea, despite Japanese orders to destroy them and plant cherry trees. The atmosphere of fear intensifies when Sun-hee and Tae-yul witness girls sixteen and older being forced one day to volunteer for work in textile factories away from home without even the chance to return home to tell their families goodbye. Park explains the Japanese use of comfort women in the Author's Note at the end of the book, but the novel's narrative only hints vaguely at what might happen to these girls. The novel starts with the Kim family selecting Japanese names after being forced to register at the local police station. The Japanese rulers have tried to wipe out Korean culture by requiring schools to teach Japanese. They have banned teaching of Korean language and history, printing of Korean newspapers, and conversing in public in Korean. Sun-hee enjoys writing Japanese kanji and keeps a daily diary, but her older brother Tae-Yul has much more interest in mechanical things rather than academic pursuits. They both enjoy conversations with their uncle, who owns a print shop, but he is forced to flee town because of his support of the Korean resistance movement. Their father serves as vice-principal of Sun-hee's school with the position of principal, like all top positions in Korean society, reserved for a Japanese man. Life for the Kim family becomes harder as the war progresses. Food shortages lead to the family's eating millet rather than rice, and the Japanese Army confiscates personal metal items for use in the war effort. In early 1945, Tae-yul enlists in the Imperial Army and goes to Seoul for training. He has always had a fascination with planes, and he also realizes that families of Army volunteers receive better food rations and clothing. In Tae-yul's seventh week of training, he volunteers for a special attack unit of kamikaze pilots after he overhears Japanese officers talking derogatorily about Korean soldiers' lack of bravery. When sent on a kamikaze mission from Japan, he plans to miss the American ships, but his squadron has to return to base when they cannot find any enemy targets due to heavy cloud cover. In the meantime, the Kim family receives a last letter from Tae-yul written the day before his mission. They believe he has died in battle, but they are overjoyed when he returns home after the war. Eleven Korean pilots actually died as kamikaze pilots in the Army during the Battle of Okinawa , but the author's description of Tae-yul's experiences as a kamikaze pilot contains a few inaccuracies. Park used two kamikaze pilot memoirs, Kamikaze by Yasuo Kuwahara and Gordon Allred and I Was a Kamikaze by Ryuji Nagatsuka, to provide details for Tae-yul's fictional experience in the Army, but some basic facts still differ from actual history. Tae-yul entered the Army in early 1945 and would have had at most five months of training prior to his kamikaze mission on June 20, 1945. Kamikaze pilots actually required at least a year of training, including time for basic training, flight training, and training for a specific type of plane. Tae-yul's short time period seems even more unbelievable with only two training planes for 200 men at his base and with training being carried out during a period of frequent American air raids and lack of fuel. Park used Nagatsuka's failed kamikaze mission  on June 29, 1945, from Kagohara Airfield near Tokyo for details contained in Tae-yul's mission, although she changed the date and other details. Tae-yul's kamikaze mission on June 20, 1945, occurs on a date in history when no Army special attacks happened. During the Battle of Okinawa through June 22, both the Navy and Army used air bases in southern Kyushu, not the Tokyo area, for kamikaze attacks. Tae-yul writes in his last letter to his family that he has been promised that it will not be censored, but this seems impossible since military officers censored all correspondence from military bases. A letter written by a Korean would be especially suspected. Nagatsuka writes in his memoir that he got thrown in the brig for three days for failing to accomplish his suicide mission , but Tae-yul's imprisonment lasts several weeks. Young adults not only can learn Korean history and culture but also can understand the value of freedom through reading this excellent novel. Although the description of Tae-yul's experiences in the Army and a special attack squadron lacks historical accuracy in several places, the rest of the book reflects Park's thorough research and her parents' personal experiences living in Japanese-occupied Korea during World War II. The actions of Sun-hee, Tae-yul, and the other Kim family members reflect their courage and love during Japan's attempt to eradicate Korean culture. Muranaga, Kaoru, ed. 1989. Chiran tokubetsu kougekitai (Chiran special attack forces). Kagoshima City: Japlan.